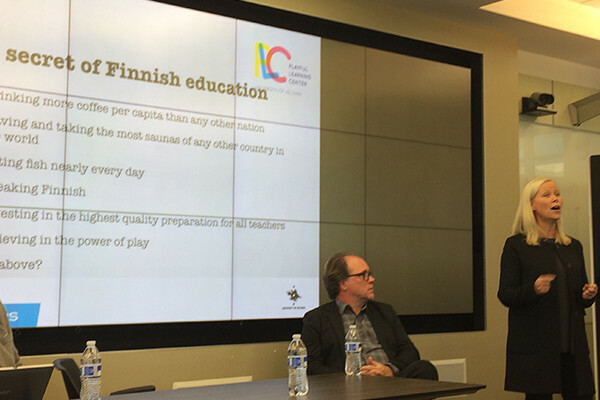 Schools in Finland are adopting the FUSE Studio program because it promotes “well-learning” and reflects the goals of the country’s new core curriculum, Finnish educators said during a recent panel discussion at Northwestern University’s School of Education and Social Policy. Though Finnish schools are considered among the best in the world, teachers are facing new literacy challenges related to digitalization and 21st century skills, said Kristiina Kumpulainen, a professor of education at the University of Helsinki. Developed at Northwestern and now operating in schools worldwide, from Schaumburg to Helsinki, FUSE includes a library of more than two dozen maker-like challenges that are designed to spark an interest in learning for middle and high school students. In FUSE, teachers are facilitators and kids work alone or form their own groups. The goal isn’t primarily to teach STEAM content but to help children develop creativity, collaboration, adaptive problem solving skills and persistence when things don’t go as planned. “Choice is a fundamental idea that runs through FUSE,” said FUSE Director Reed Stevens, professor of learning sciences at Northwestern’s School of Education and Social Policy. The student-centered, hands-on FUSE philosophy dovetails with Finland’s new core curriculum, which “emphasizes the joy of learning and the pupils’ active role,” according to the Finnish Ministry of Education and Culture. “FUSE resonates very, very strongly with what we believe is the future of education,” said Kumpulainen, director of the Center for Playful Learning at the University of Helsinki and a teacher educator. In addition to academic learning, Finland emphasizes the value of play, which in turn, promotes well-being,” Kumpulainen said. Kumpulainen was part of a group of visiting Finnish educators which included Pasi Silander, who oversees 130 schools as the digitalization lead for the City of Helsinki’s education department, two principals of top-performing schools in Helsinki that are currently using FUSE and two education researchers. The team visited schools in Schaumburg and Chicago to see FUSE classes in action and spent time on Northwestern’s Evanston campus working with the FUSE research and design teams. During the panel, Silander stressed that an educational revolution is needed in Finland and FUSE will be part of the change. Arabia School Principal Mari Suokas-Laaksonen said she was intrigued by FUSE from the moment she saw the website. “We are very interested in design thinking and learning,” said Suokas-Laaksonen, whose public school has been cited as one of the best in the world. View the video of the panel discussion.